There’s been a lot of talk over the last few days about Steven Stamkos’ scoring (or lack thereof) in the Stanley Cup Final. The Tampa Bay Lightning captain didn’t score a single goal in the series with Chicago, and wound up with only one assist on his stat line. People have been quick to criticize that level of production, but a casual look at the numbers suggests that said criticism is misplaced. When dealing with a six-game sample size, it’s hard to draw a ton of conclusions from the goals and assists columns. A string of good luck can make a player look great, while a run of bad luck can make a player look completely impotent. Shooting percentage and save percentage, two largely variable statistics, can completely change the optics of a small sample. That’s what we saw with Stamkos in the Stanley Cup Final. He ran into a hot goalie, and wasn’t very lucky. Lightning coach Jon Cooper has consistently said that players who get opportunities will ultimately be rewarded. It essentially boils down to the law of averages. If a player (e.g. Stamkos) continues to get himself in positions to score, eventually the puck will start working its way across the goal line. Again, sometimes that doesn’t happen in small samples, but the general theory is a good one. 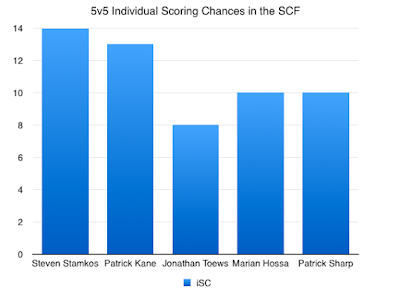 Like Chicago's scorers and stars, Stamkos was sub-50% when it came to on-ice scoring chances at five-on-five. That might sound terrible (it's certainly not ideal), but it's really not. In fact, it's sort of expected. Stamkos, like Chicago's big guns, was tested with a top defensive matchup each and every time he was out on the ice. Creating opportunities under those circumstances isn't easy, but Stamkos was able to do it with more regularity than most of his Chicago counterparts. But, the criticism that has been dished out over the past few days hasn't been directed at Stamkos' line as a whole. Rather, it's been directed squarely at the captain. Nobody has questioned Alex Killorn or Valtteri Filppula or anyone else with whom Stamkos played. Nope. Every comment has been thrown right at Number-91's feet. Individually Stamkos was creating more opportunities for himself than guys certain fans and media personalities view as 'clutch' (terrible narrative). 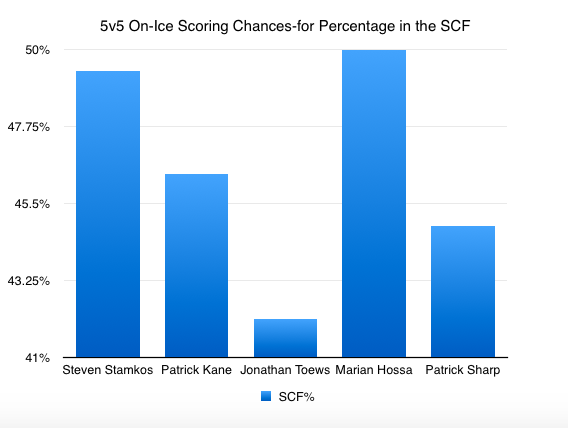 In fact, only one player created more individual scoring chances at five-on-five than Stamkos in this series; that player was Nikita Kucherov. Are we legitimately supposed to believe that Stamkos is somehow a lesser player because he didn't convert on the opportunities he created in a SIX GAME sample? Does that lack of production really mean that he isn't worth a big contract? Do you really think that he is going to remain goalless forever? I think we all know the answer to those questions. His "inability to produce" had more to do with Corey Crawford playing lights out hockey in the Chicago net than anything else. He wasn't shut down. He didn't disappear in the big games. Stamkos isn't any less "clutch" than the so-called "clutch" players. He created chances when the chips were down. He can't control much more than that. Scoring is hard, but if Stamkos went back and replayed each of those chances again, it's hard to imagine that he would be looking at more zeroes. Maybe next time his shot hits the crossbar and deflects down into the net. Maybe next time the puck lifts over the goaltender's pad. These are small misses that distract from what was actually a very good process. Stamkos created opportunities both individually and with linemates. He was more than good enough for Tampa Bay.